Why doesn''t the Walt Disney World Dolphin have an FAA light on top of it as it is well over 200 feet? Maybe we can solve this! That IS an interesting question...as an ex-radio guy, those lights always interested me...I was at a book signing/ Q & A that Marty Sklar gave a few years back before he passed here in NJ, and asked him why we never see commercial jets flying over WDW and asked specifically if there was a "no fly zone" over the kingdom...he said emphatically NO, that there are sight seeing aircraft that fly near (but not directly over) WDW. He never really answered the question. I asked our airline pilot a few years back if there was a no-fly zone, and he and the co-pilot looked at each other and laughed, but didn't give me an actual answer either...maybe it's an unwritten rule between Walt, the airport and the FAA? I don't know, but it's an interesting question. Just as a side note, because I AM a radio "geek", I actually have one of the old style tower beacons on my fireplace hearth...you don't think they are as big as they actually are...the traditional ones are about 2 1/2 feet tall and a foot in diameter...there are 2- 700 watt incandescent bulbs in it, both about 12" long. Needless to say at that wattage, it doesn't get lit up that often...lol. Now the newer beacons are either xenon strobes or LED, so the tower guys don't have to climb to replace the old fashioned bulbs that often. That's just it...there is NO beacon light atop the building...never was. He didn't say anything about checking to see if the hotel's are over 200 feet. Looks can be deceiving. Disney does it everyday. All it has to be is 199.9999999 to be able to go without one. Not so much no fly, more restricted flight. Aircraft are banned from flying below 3000ft within a 3 mile radius of pretty much Discovery Island in Bay Lake. This covers the MK area and almost all of Epcot. OK, just throwing that out. There must be some thing. Maybe since they have to be at 3000 feet and those buildings are lit like a Christmas tree all night long, that the clearance light is not necessary. The castle and ToT at times could be in the dark creating a different problem. When I took the helicopter tour we were pretty close over Epcot (it didn't seem like 3000 feet to me, but, I didn't bring my tape measure with me) and were told that they couldn't fly over MK because of the no fly thing. Quite a mystery, but, I suspect that the answer will be very boring. True, but you never see commercial planes flying over Disney, at all....I suspect WDW has some sort of agreement with the FAA to keep flight paths away from the complete complex. Knowing how Walt was for details, I wouldn't be surprised if that fact wasn't agreed upon before the first shovel went in the ground. Or it could simply be that all of the runways at Orlando International Airport run north-south. Walt wanted a commercial airport at Disney World. They are north-south and the terminal building is almost due east of the Magic Kingdom. This is definitely not the case. I fly to Orlando fairly frequently and at least half the time we’ll fly right between Hollywood Studios and Epcot. Yep, I have flown directly over WDW a few times, usually when taking off from MCO when the planes are taking off to the south and have to circle north. I've seen all four parks from the air. I have a question - how tall are the Lake Buena Vista / Disney Springs hotels? I can't recall if they have an FAA light but I don't think they do, unless we just can't see it. The restricted flight zone was only introduced in 2003 after a lot of pushing from Disney. The FAA are known to not to be keen about it. Even so, MCO has one flight path that takes flights south to north virtually along Epcot Center Drive, behind Mexico and Test Track. Walt had been dead for a couple of years before the first shovel went in the ground. And when he died in 1966 the Florida theme park was just a cut-and-paste copy of Disneyland circa 1965. But when Walt was alive and running Disneyland in the 1950's and 60's he insisted on a heliport right at Disneyland. It was a stop on Los Angeles Airways route from 1956 to 1972. And they were giant Sikorsky's that thundered and roared and shook the china cabinets on Main Street USA when they went overhead several times per day. It wasn't subtle, and it didn't theme with any of the lands at all, but Walt thought it was cool so it stayed. Disneyland service started in 1956, landing in the Disneyland parking lot. That's the TWA Rocket to the Moon in the background. 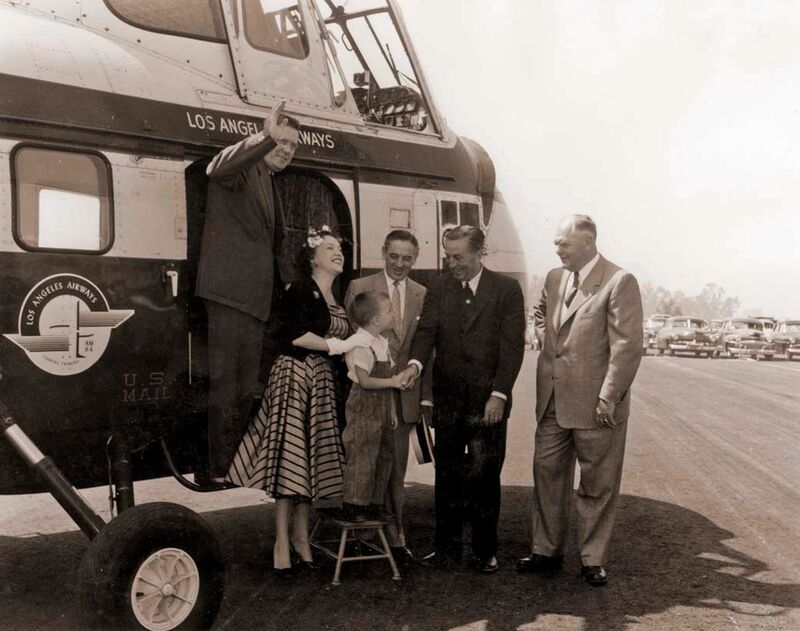 Giant Sikorsky copters thundered over Walt Disney's Magic Kingdom via scheduled service to LAX, Long Beach, and Newport Beach several times per day. Per Walt. Here's Walt in the Disneyland parking lot welcoming some of the first LA Airways passengers to his park. 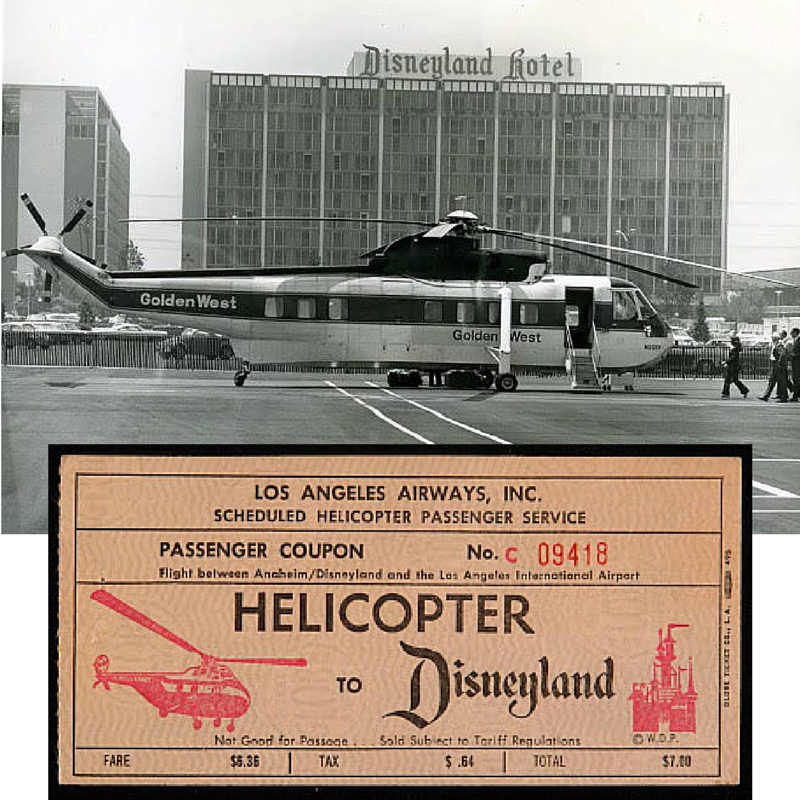 By the early 1960's the Disneyland Heliport moved across the street to the Disneyland Hotel. A flight to LAX was 7 bucks, about $55 in today's money. If Walt had lived to see any shovels at work in Florida, much less see what the place is like now, he'd want to know why there aren't helicopters and small jets landing along Bay Lake. Just make sure the China Shop on Main Street USA knows the flight schedule so they can close up the display cases before the rattling starts. I think size and shape, grouping of buildings and prominent building status has been pulled into question! I expect this is what made this decision. I can't find anything solid that rules it out but the reason would of been in an individual assessment of the building that has been added to aviation maps. If they want to, I'll sit up on the roof with a red lensed flashlight and blink it on & off when a plane approaches. All they have to do is pay for my park passes and DDP. While I cannot give a definitive answer on the Dolphin, I can talk a little about conspicuity lights. At one time I had a microwave transmission engineering team, and every so often the lighting requirements on our towers came up (especially when we increased the tower heights). There are a lot of factors that go into the lighting requirements with the FAA, including general aviation in the area, the terrain and a whole bunch of other things. It is a mountain of paperwork, and the FAA will look at your tower application and come back with what you need to do. I assume buildings use the same process.